The end of the war in Europe on November 11th 1918 was greeted with great rejoicing and celebration, but the difficulties associated with the conflict were by no means over. The country, including many towns and villages in Dorset, was in the grip of a flu epidemic. In Bourton over a hundred foundry employees were absent through illness, and the school was closed. Soldiers were still serving abroad, or were prisoners of war, and in Fontmell Magna, arrangements were made to send Daily Express tuck boxes to men serving abroad, continuing a tradition of sending Christmas gifts for every year of the war. Prisoners of war started returning home, with stories of their treatment in enemy hands, and one Fontmell Magna man, Sidney Mowlem , was given a watch paid by subscription to mark his return after what he had endured in prisoner-of-war camp. Flags were hoisted and in many cases work was abandoned as people gathered to celebrate, attend special services in church, or ring peals of bells. In Shaftesbury bells were rung and bunting adorned the streets. The mayor asked shops to close between three and four o’clock for a united meeting of thanksgiving and prayer outside the Town Hall. In the evening the band of the Motcombe Boy Scouts paraded through the town. New houses for returning soldiers and their families were built on Coppice Street, and two ex-army huts from Compton Chamberlayne were re-erected at the western end of Bimport, and are still occupied in 2017. In August 1916 Lord Shaftesbury asked the Western Gazette to publish a correspondence between himself and the Bishop of Salisbury concerning the erection of village crosses as memorials to those who had died during the war. Both were agreed that these would be a fitting tribute and Lord Shaftesbury wanted to share the suggestion with the public. In February 1919 the town council started discussions about an appropriate war memorial. Alderman Borley suggested deconsecrating St Peter’s Church and turning it into a public hall, and another member wanted to enlarge the lower part of the Town Hall, again for use by the public. The War Office also offered trophies to town councils, and Shaftesbury Town Council opted for a German gun. A howitzer was duly delivered. 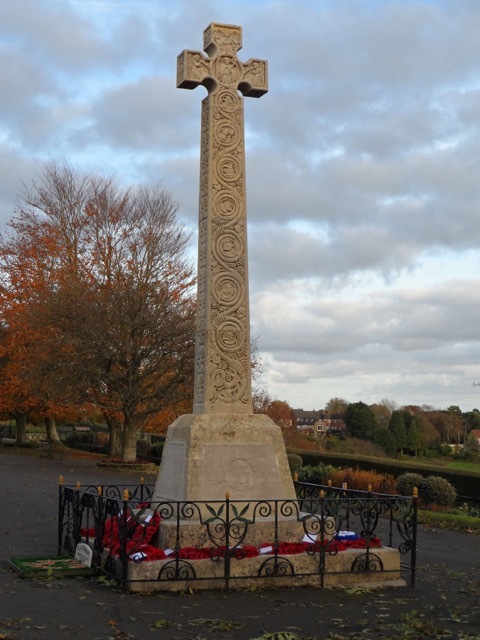 In Fontmell Magna it was unanimously agreed to erect a marble memorial cross by the village maypole, listing the names of those who had died in the war. 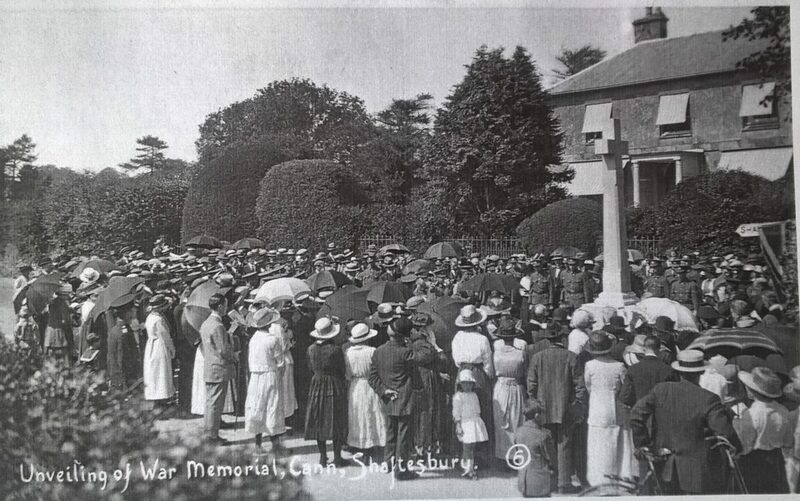 In 1920, Lady Stalbridge unveiled the Motcombe War Memorial which was dedicated by the Bishop of Salisbury. In 1928 the Memorial Hall was officially opened, although by this time Lord and Lady Stalbridge had sold the Motcombe estate and moved away. On that delightful promenade, “The Park”, one of the connections between the higher and lower portions of Shaftebury, there took place on Sunday afternoon one of the most impressive and soul stirring ceremonies in the history of the old borough. It was Shaftesbury’s day with the dead. Here upon this windswept walk, in the chilly, moist atmosphere of an October day, hundreds of townspeople honoured the memory of the 60 men of this City of Pallador who gave up their lives in the service of their King and Country. The ceremony was preceded by a procession from the Town Hall. It was led by the local constabulary, followed by the Comrades Band, The Territorials and several hundred ex-servicemen from Shaftesbury and Gillingham. The Mayor and members of the Town Corporation followed, with the Shaftesbury School Cadets, Boy Scouts, Girl Guides and various friendly societies. After a service in Holy Trinity Church, the memorial was unveiled by Lord Shaftesbury, and wreaths laid, including many from the families of the fallen men. Six years after the end of war, ex-servicemen were still experiencing difficulties obtaining pensions, some of which were only temporary or conditional. Some men who were only slightly disabled and ready to work did not want to take any pension, but were advised to do so. The British Legion held a conference in Gillingham, seeking to advertise their role to a rather disinterested public. By 1924, the British Legion had already helped over half a million cases of distress. It was suggested that local committees met in public houses to attract more men to their cause. 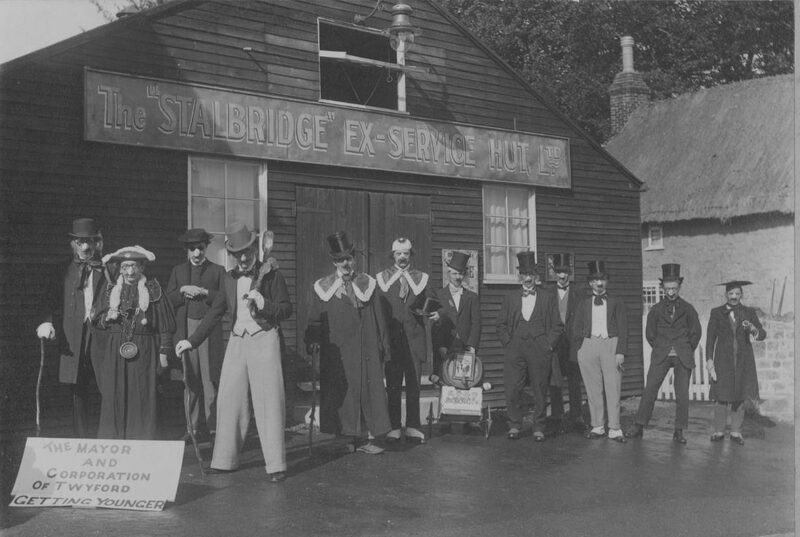 After the war, Lord Stalbridge gave land for a meeting place for ex-service men on Bleke Street, known as the Stalbridge Hut. In 1925 when the Motcombe estate was sold, the club was granted a 99 year lease at an annual rent of 2/6d (12p). In the decade after the end of the Great War there were far-reaching changes in land ownership. Many of the owners of large estates were faced with heavy death duties and increasingly unprofitable agricultural properties, which forced several significant sales in the Shaftesbury area. These usually included several farms, water mills, schools, inns, shops and private houses. Lord Stalbridge initially sold the town for £75,000 in September 1918 to a Londoner, Mr White. The contract required him to offer the town for resale to the mayor and corporation, or to a representative of the tenants, before selling it on elsewhere. Mr White gave the corporation seven days to come up with £80,000, or the tenants a month. After his purchase of the town, Mr White commented thus: ” I saw a bill, with the heading ‘Town for sale’. (Shaftesbury) is one of the prettiest little villages I have seen. To call it a town seems almost ridiculous. Yet I suppose one must, for it has its own mayor and corporation”. The mayor and corporation could not afford to buy the town, so The Syndicate stepped in and bought it for £80,000 a few days later. ‘The Syndicate’ comprised three influential figures in Shaftesbury, Mr Robert Borley, owner of The Grosvenor Hotel; Dr W.J. Harris; and Mr H. Viney, manager of Stratton, Sons and Mead, the largest commercial business in town. The Syndicate held a further auction on May 28th and 29th 1919, dividing the Shaftesbury property into 313 lots. Before the final auction took place, the Shaftesbury Tenants’ Association was formed to protect the interests of the current tenants. It was feared that The Syndicate might sell to the town to outsiders, contrary to Lord Stalbridge’s wishes. In the event most of the former tenants were able to buy their own houses and businesses, taking out loans where necessary to pay for them. The town corporation bought the Fire Station, the Market House, and the Cattle Market. The corporation also bought allotments in Coppice Street, where they intended to build new houses, and the Boy Scouts’ Hall. Extension of the Borough sewers together with an extension of the borough boundaries. The boundaries were extended so that comprehensive changes could be made to the town’s infrastructure, and the acreage of the borough was increased from 156 to 514. Unemployed miners from South Wales were brought in to extend sewers throughout the town. Two public spaces were saved for the people of Shaftesbury. The corporation bought the Park, and Dr Harris bought Castle Hill and gave it in perpetuity to the town. The Abbey ruins were withdrawn from sale, as they were considered to be an important monument which should be properly administered, and a suitable bidder was not forthcoming. The Abbey was scheduled as a historic monument in 1924. It was agreed that the Post Office and the Literary Institute in Bleke Street would be leased for 21 years, continuing the previous arrangements with Lord Stalbridge. Robert Borley bought Barton Hill House for his home in the sale and the bowling club committee bought the bowling green. 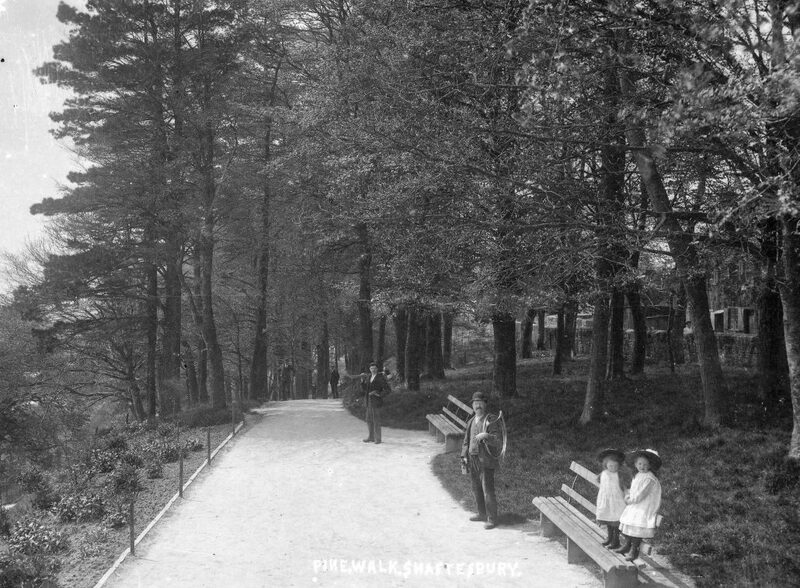 The recreation ground on Barton Hill was created in the 1920s. On the death of his father Sir Richard Glyn in 1918, his heir, also Sir Richard Glyn, inherited a large estate on which heavy death duties were payable. He decided to sell part of his inheritance to pay the debt. Although the Glyns had made their money in railways and banking, they became country gentlemen, owning 9,000 acres in Dorset. The Glyns had been enlightened and able landlords and the sale of their estate in 1919 resulted in considerable upheaval in the villages. Tenants became owners and freeholders and the supporting structure of services provided by the Glyns was withdrawn. The community of Melbury Abbas became less tied to the village and also more fragmented, as did those in the other villages such as Compton, Fontmell Magna, Cann, Margaret Marsh and East Orchard, which were all sold during the post war period. The property auctioned in 1919 comprised an agricultural estate of 5,550 acres, with thirty-six dairy and grazing holdings, six corn and stock farms, three water-powered corn mills, cottages, schools and two temperance inns. shops and cottages with gardens, 1,690 acres in all. In 1919 the estate included two big farms: East Melbury Farm (nearly 700 acres) and Manor Farm (600 acres, including 400 acres of downland). The estate was sold over two days in July 1919 at the Market House, Shaftesbury and the sale catalogue, of which several copies survive, is an informative original source for this time in Melbury’s history. There were three mills in the catalogue, French Mill and Cann Mill were described as Corn Mills and Gears Mill as ‘a smallholding’. Melbury Mill which was a flourishing enterprise at the time was no longer part of the estate. The cottages, many of them tied to a particular farm, numbered about one hundred. Hugh Grosvenor, an officer in the 14th Hussars, became the 2nd Baron Stalbridge. In 1903 he had married Gladys Elizabeth Nixon and they had one son Hugh Raufe Grosvenor born the following year. In 1914 Hugh Grosvenor and his wife moved to Motcombe House as Lord and Lady Stalbridge. At the end of the war in 1918 Hugh returned to civilian life. He had little interest in running the estate, preferring activities such as yachting, polo and breeding horses for racing. This led to the sale of the 13,500 acre estate, and this was not completed until 1929. Farmers had little incentive to purchase the freeholds as the government had removed their wartime subsidies and money was not available to them. In 1929 Charles Prideaux, owner of the Motcombe Dairy, bought Motcombe House to prevent its demolition. He never lived there, preferring to live in The Grange, which he had built for himself in the village. However every Sunday, after church, he would drive with his daughters to the house to check all was well. Motcombe House is now Port Regis School. James Hainsworth Ismay bought Iwerne Minster House and Estate in 1908, to enable him to take up his passion for farming. When WW1 was declared he was too old to be called up and was eventually transferred to the Queen’s Own Dorset Yeomanry. Ismay was a very attentive landlord. He wrote to all the men from the village fighting for their country, telling them what was happening at home and encouraging them to respond. He put their news for all to read on a notice board on the village pump known as “The War Office”. Because of food shortages, large areas of grassland on his 400 acre estate were ploughed up for additional cereal crops. He bred prize winning shorthorn dairy cattle, pigs, sheep and chickens. He built farm buildings, did repairs when necessary, provided a shop and generally oversaw the needs of the village. After the war Ismay was responsible for the erection of a war memorial. 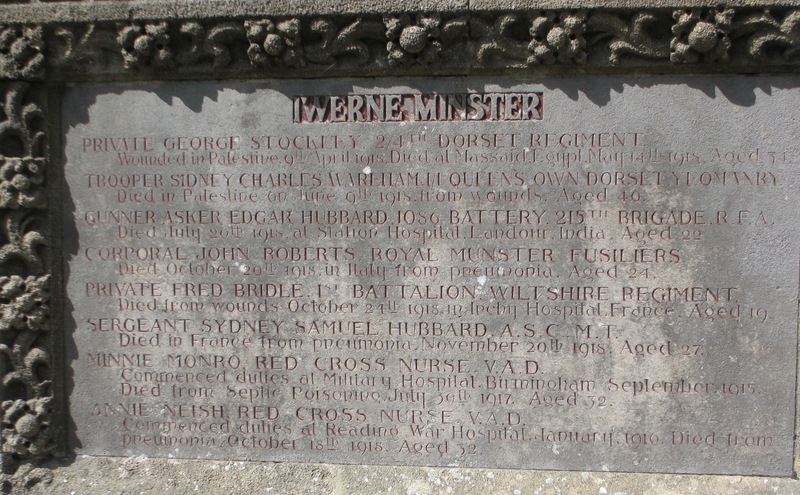 It was dedicated by the Bishop of Salisbury on 12th April 1920 in memory of the twenty one men and two women from the village who had lost their lives . The first part of the service took part in the church and then the vicar, churchwardens, demobilised men, Boy Scouts and others marched to the Memorial Cross. Later the site was handed over to the Parish Council. The following year a village club was built and Ismay was instrumental in getting one returned soldier, Charlie Brookes, a prosthetic leg and organised for him to go to London to train as a barber. Brooker returned to Iwerne Minster and worked as a barber for the rest of his life. His house still bears the name Barber’s Cottage. James Ismay died in 1930 aged 63. 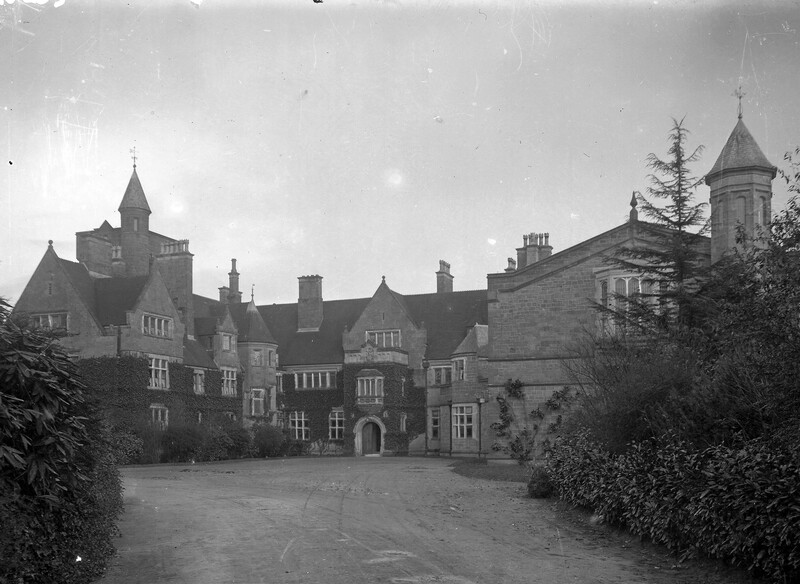 The estate was sold and The Manor became Clayesmore School in 1933. 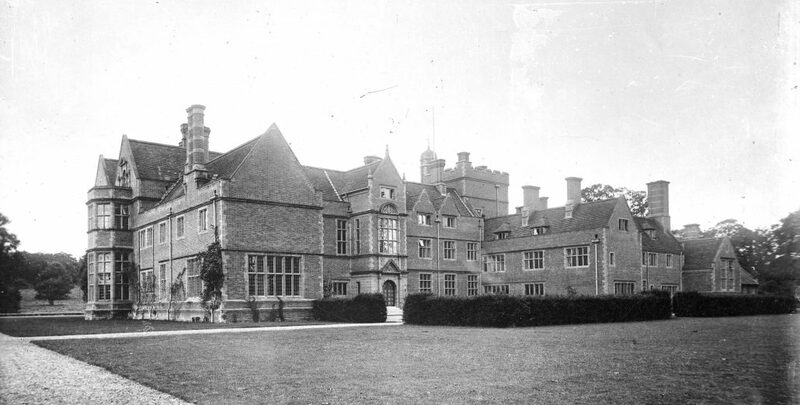 Coombe House, now St Mary’s School was built by Mark Hansbury Beaufoy in 1896. He was an English vinegar manufacturer from the East End of London, and a liberal MP. Mark Beaufoy supported the introduction of the eight hour day and introduced it into his vinegar business. He also chaired a meeting which founded the English Central Society for providing homes for waifs and strays now known as The Children’s Society. He regularly brought children down from London to have a holiday on the estate. Coombe House was built on the high ground at the west end of the Coombe valley near Shaftesbury. The estate included 1500 acres of land and Mark Beaufoy, being a real enthusiast in game shooting, used the land for that purpose. He also ran a second shoot at Ashmore. In 1911 he enlarged the house with a south wing which incorporated a ballroom for the marriage of his daughter, which was a major social event for the town as well as his family. During WW1 he was scout master of the Shaftesbury Boy Scouts and the annual scout camp took place in the ground of Coombe House. In his youth he had kept mastiffs and bloodhounds and from 1920 until his death in 1922 he was Chairman of the Kennel Club. His son Henry inherited Coombe House but six years later sold off most of the land and then in 1930 the house was sold and became a hotel. www.dorsetlife.co.uk Iwerne Minster and the Titanic connection.